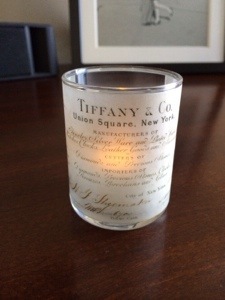 I received a set of these votive candles as a bridal shower gift last year! I absolutely love the vintage feel and history behind it! The story of how Tiffany and Company became the luxury brand it’s known for today is remarkable! I never tire of hearing the story and these candles remind me of the beginnings! Some of these items are stuff I hope I can pass on to a daughter one day! What is your favorite part of Tiffany’s history? Please share, I would love to hear!